Produced by Jerry Bruckheimer and directed by Rob Marshall, this new exhilarating adventure captures the fun, excitement and humor that ignited the hit franchise - this time in Disney Digital 3D. 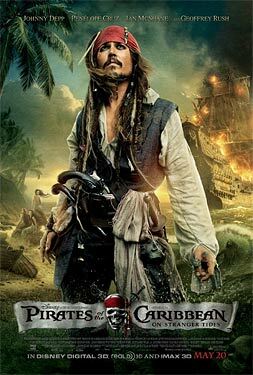 Johnny Depp returns to his iconic role of Captain Jack Sparrow in this action-packed journey that finds him crossing paths (and swords) with the enigmatic Angelica (Penelope Cruz). When she forces him aboard the "Queen Anne's Revenge," the ship of the legendary pirate Blackbeard (Ian McShane), Jack finds himself on an unexpected voyage to the fabled Fountain of Youth, where using all his wiles, he is forced to deal with Angelica, with whom he shares a dubious past, and the beautiful enchanting mermaids whose masterful cunning can lure even the most seasoned sailor to his doom.